This is a beautifully illustrated introduction to a classic Charles Dickens book and a start in leaning to read and spelling words in English! Using one of the greatest books of English Literature - without having to read the whole book.....! 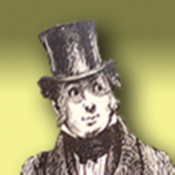 Dombey and Son interactive summary app is the first of what will be a four app series called "What the Dickens? ", these apps will give the viewer a summary of the book with audio. Divided in to twenty-six sections, one for each letter of the alphabet, A to Z. The first screen for each letter has a summary section of the story with a word highlighted that starts with the associated letter along with audio of the summary story. The second screen shows the full illustration plus the option to go to the 'Spell Screen' where you are challenged to spell the highlighted word. The app contains classic illustrations of the period, brought up to date for the new world of apps.